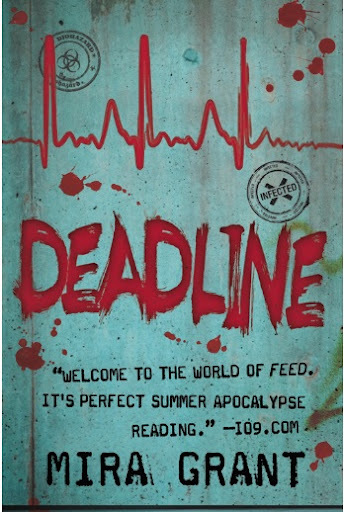 Deadline (Newsflesh Trilogy Book #2) – Mira Grant. This review is going to be a lot shorter than my other reviews because it is imperative that I don’t run my mouth off and spoil everything for people who have not only read this book but also Feed. WHAT IS WITH THE ENDINGS OF MIRA GRANT’S BOOKS? And, what was that? We have to wait for months until the next book comes out?! COME ON. I have one major low point…. But I can’t tell you what it is because it will spoil everything. I’m such an advocate for not spoiling books and films because finding out what happens at the end of something you’ve wanted to read/watch really is the second worst thing that can happen (first is when someone pokes you in the side when you’re mid-stretch.. bastards!). I believe it should be Forbidden. Shaun is just as HOT as he was in the first book, but now he’s narrator we get to see a lot more of him and the depths that Grant adds to his character just makes me love him even more. Even though I was sort of won over by George as narrator in the final few chapters of Feed, I thought Shaun was a better narrator and injected a bit more character into the series. I just really loved how Grant created a completely other side to Shaun in this book. I want to say soooo much more but I won’t. OK, we get it…there are zombies in this book and this is perhaps the most obvious song and also… the troubles in Ireland have NOTHING to do with this book. BUT- I chose this song for three reasons. 2) If you’ve read this book you will know the chorus is particularly important. Sob. 3) The soothing vocal chords of Dolores O’Riordan will help you get through the emotional anguish this book puts you through. People who have read Feed. Basically. And also people who thought anyone who was shocked at the ending of Feed was for sissies. TRY THIS ONE ON FOR SIZE. I literally can’t believe we have to wait a year…. A WHOLE YEAR… for the next book to come out. Why? WHY DO YOU HATE US, MIRA GRANT? Just found you through your review on Goodreads and your comments (and other reviews I skimmed through) made me laugh. I just finished Deadline yesterday and I have to say: “FFS, what was that cliffhanger all about?!! !” So happy I can finally share this with someone. Anyways, I am following your blog now and I am looking forward to your future reviews. « The Perks of Being a Wallflower- Stephen Chbosky.